Steve Jobs was an innovator, that is for sure. I guess that he could also have been a difficult boss sometimes. The Silicon Valley urban legend of an elevator ride with Steve Jobs…. ’nuff said. The direction Steve Jobs took Apple in, undoubtedly played a huge role in the success of the company and its products. We all know a single person doesn’t make a company. The employees do, but a leader with a clear vision goes a very long way. Secretive at best, Apple holds closely guarded secrets with regards to the inner goings on and rumors are rife. What happens at Fight Club, stays at Fight Club, or so one would like to believe. There is one story I could easily imagine is true, and that is the initiation or orientation of new employees. Your first day on the job, you are welcomed and given a welcome package consisting of stickers saying welcome to Apple, HR forms and a shirt with, “Class of” and the year you joined on it. New employees also get a brand new iMac. The difference is that there isn’t such a thing as a techie running around connecting new employees’ machines to the network. If you were smart enough that Apple hired you, they assume that you are smart enough to connect your iMac to the company servers and set up everything yourself. This obviously also gets you, as a new employee to connect with your colleagues around you. Also during the orientation, new employees are reminded and warned that leaking company information (intentionally or unintentionally) will result in their immediate dismissal. Then new employees are given lunch, their first and last free lunch. But what about Steve Jobs himself. What kind of person was he? The Internet is full of stories about Steve Jobs. One in particular that I found simply hilarious is this one that Tomas Higbey recounts in answer to a question on Quora. I said Mandela since I had just been there as an international observer for the elections. In his confident fashion he stated “NO!…you are all wrong…the most powerful person in the world is the story teller.” At this point I was thinking to myself “Steve, I love you but there is a fine line between genius and loco..and I think I am witnessing this right now”. Nikhil Sohoni on Quora shared this moment in time, story. My wife and me were walking in downtown Palo Alto one afternoon when I notice a man walking towards us. I immediately recognized Jobs and nudged my wife. Nobody noticed him as we walked down the pavement The year must have been 2003 and I had just ordered a pair of Keen sandals off the Keen website. Back then Keen was not well known and you hardly saw anybody wearing Keens. As Jobs got closer, there was moment when he looked at my feet and noticed the Keens I was wearing. He was wearing an identical pair. He looked up at me and gave me a smile and a nod. He then walked passed us and stopped to take a look at the Apple store from the other side of the street. A minute later he turned and continued on his way. 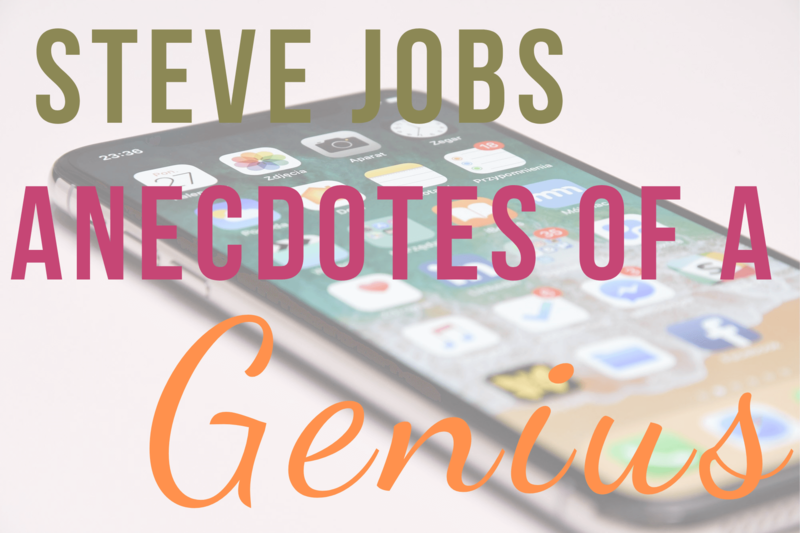 Steve Jobs influenced many, very influential people. One of those people was GuyKawasaki. The day after Steve Jobs passed away, Guy Kawasaki was to give a speech on how to enchant people. Needless to say that Guy changed his speech and instead talked about the 12 things that Steve Jobs taught him. This is long, but very well worth watching. Something that I will never forget as long as I live, are these words by Steve Jobs. This is why the man was so successful at what he did. I think it encompasses all the genius that defined him. The world is a better place for having him influence it so dramatically.